Amongst all the laughter at terrible recipes that can be found on line (see this post) , I stumbled across a rather fabulous recipe for sugar cookies at bakeat350.co.uk I was after a "no spread" cookie recipe as often when I try to make cookies (UK translation - biscuits) they lose their shapes and spread all over the place! DD and I tried this recipe this afternoon, we divided the mixture and made some plain and some with chocolate chips, some plain chocolate and some colour chocolate beans! 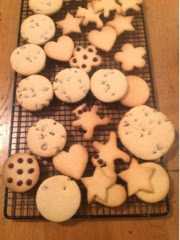 W experimented with thickness of the cookies too, making some thinner and crispy and some fatter and softer. Both types were nice! 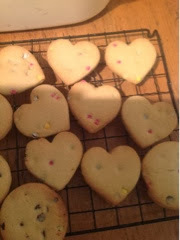 DD was keen to try the new cookie cutter that Father Christmas had given her and the cookies turned out really well! It's a recipe I will be printing out and sticking in my recipe book. Mix the flour and baking powder. Cream the sugar and butter. Add the egg and vanilla and almond extracts (if required) mix. 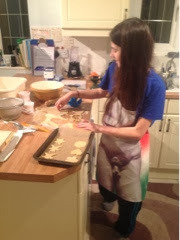 Gradually add the flour mixture and beat until combined. The dough is crumbly, knead it together with your hands until it's in one lump for rolling. 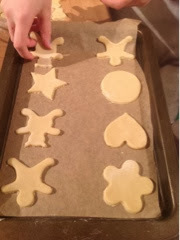 Roll on a floured surface to about 1/4" to 3/8" thick, and use you cutters to cut it into shapes, knead left over bits back into a ball and re-roll until it's all used up, places the biscuit shapes on baking trays (use parchment to prevent sticking) and bake for 10-12 minutes. Let sit a few minutes on the sheet, then transfer to a cooling rack. Decorate as required.